This LP has 23 parts. 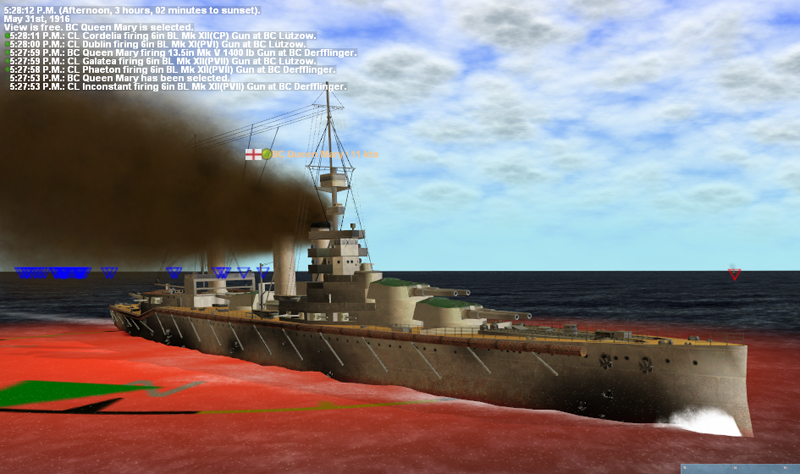 Original Thread: Jutland - There's something wrong with our bloody ships today! "There seems to be something wrong with our bloody ships today,"
Vice Admiral Beatty, after the loss of the HMS Queen Mary and the HMS Indefatigable to explosions. 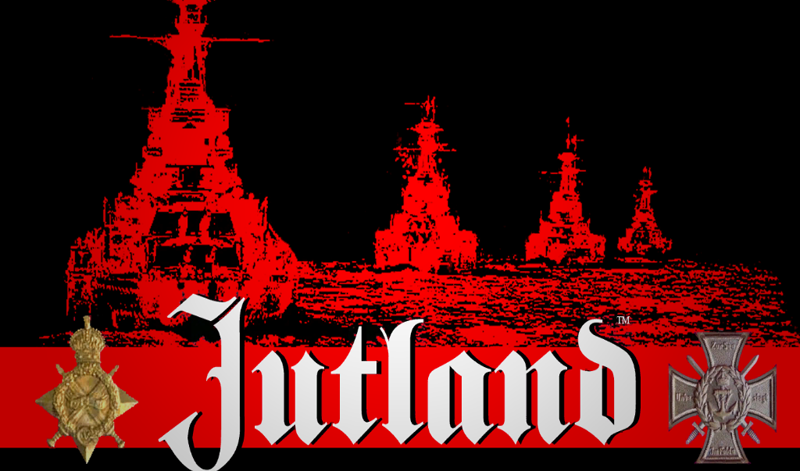 Welcome to My Jutland LP, this is a game by Storm Eagle Studios which portrays the titular battle, the largest Sea battle both of the WWI and between Dreadnought era ships. This is a game that will allow you to command either the 37 Battleships and Battlecruisers and 114 smaller craft of the Royal Navy's Grand Fleet, against The German High Seas Fleet of 21 Battleships and Battlecruisers, 6 pre-dreadnoughts and 77 smaller craft. These two fleets of mighty warships met on the 31st of May, 1916, and fought a battle that lasted for nearly two days before the Germans retreated back to their ports. The battle was claimed as a victory by both sides, and although to long to go into here, it was one of those rare cases of at tactical victory and a strategic defeat. In that on a pure tonnage sunk, the Germans won the battle, but the battle did nothing to change the naval blockade that was strangling Germany, and the British fleet was still a force to be reckoned with. Ah, well, in 1906 the British Navy launched the HMS Dreadnought, a ship that revolutionized naval warfare, and set the pattern or warships for the next thirty odd years, until people realized that aircraft carriers we're the way to go. The Dreadnought style ships we're faster and more heavily armed than their predecessor, and soon became the must have ship for all major navies. 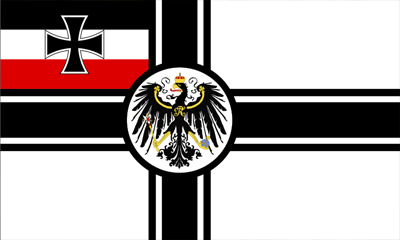 of course, with their smaller navy, Germany could not afford to leave out any of their large ships. This is another debated issue, but they are fairly equal, as although the British ships are more numerous, they also had a tendency to explode from single hits. The less numerous German fleet was better armoured and designed (They are Germans after all)- and had Superior night fighting capabilities. The game is played out in real time,with the player taking control of one one of the sides, either in a campaign or a set scenario. the orders are fairly basic for each ship, head speed and a couple of fire orders for both the guns and torpedoes. the actual targets are chosen by the computer, and it will control the ships with a good degree of intelligence, making collisions rare. Ships will fire on targets they deem important, shot tracing is modeled, Where a ship reports the splashes made by its rounds, and then reports back adjustments. 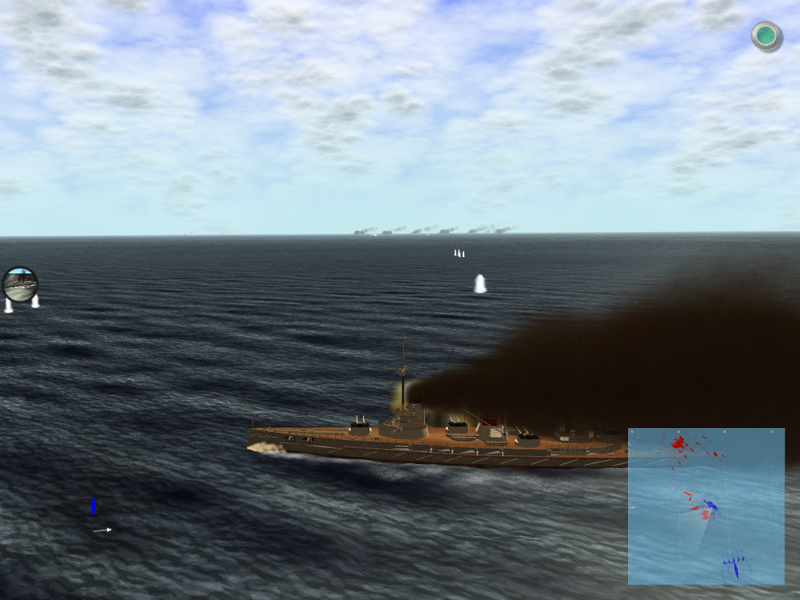 if two ships are firing on a target, they gain a bonus as they can use each others shots to help gauge the range. but once three or more ships start firing on a single target, a penalty is imposed, as no ship can be sure where it's shell landed. Damage is well modeled, with each gun being tracked individually, as well as flooding, fires and damage control. 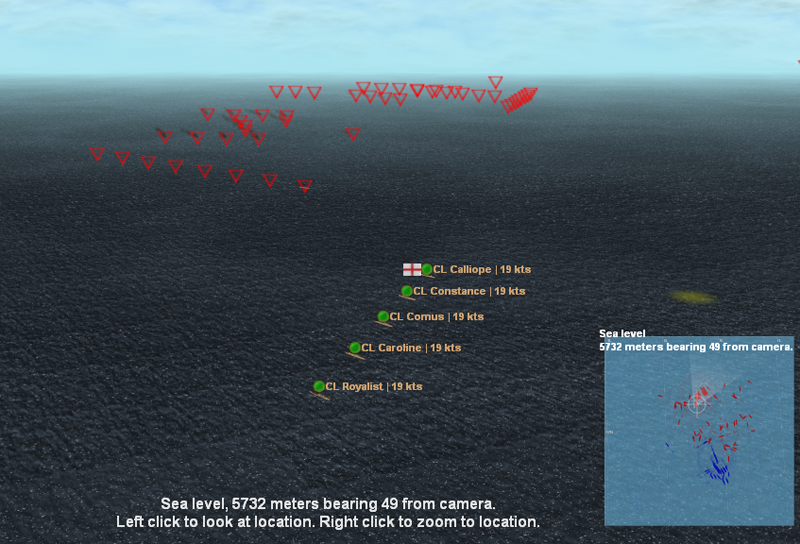 Ships will often continue fighting, even if they are sinking, which can take tens of minutes for some ships. on the other hand, a critical hit can send a ship to the bottom in seconds. Damage control is rated by the number of available crew, so a ship that slows down and stops firing has more men available, and will repair damage quicker. hits to a ship will also kill crew, as will flooding and fires. 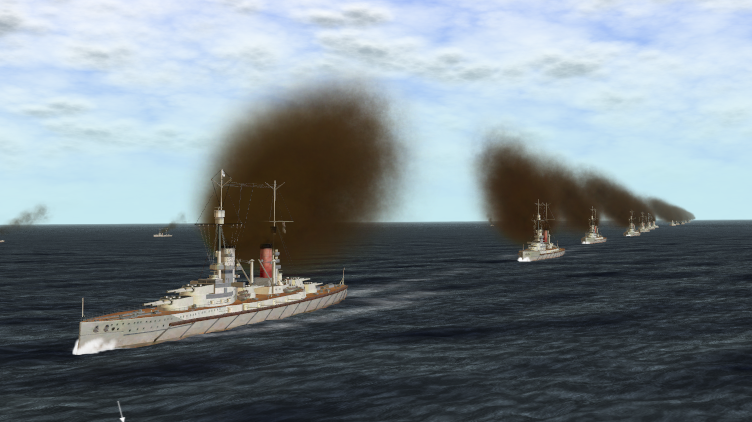 The AI is average, it handles the ships well, but closes to ahistorically close ranges when engaging, while it may not be historical to see Battleships dukeing it out at two thousand yards with their big guns, it at least looks cool. As that's my only criticism of it, I think that stacks up well. Also, what other game allows you to control a fleet of ships with 15" and 16" guns? Lastly, I will say a word about the games DRM, its of the "phone home" variety, the game needs to verify over the Internet every seven days of playing or it will stop working. While not as paranoid as some setups, Its another example of a small developer getting paranoid over his baby. the game also limits you to one license, forcing you to "destroy" it before moving it to a computer. - I have used this when my last computer gave up the ghost and I had to move without uninstalling - as long as you have your license code and login details, it can be done from any copy of the game. I only mention this as I know people often buy LP'd games they like the look of, and I want to mention it up front. Wait? Three LP's at the same time? You Mad! I thought I proved that when I started a possibly 5 year long LP (9 months old and still going strong people) - Lets just say I'm fairly sure I'm not biting off more than I can chew. I have a big mouth and powerful jaws. So whats this LP going to be like? I don't have a clue yet. I'm torn between doing this as a straight LP, or a Take Command style LP (Yes, that is a term I came up with, but I'm going to dam well use it.) of one of two flavours. the reason for this is because this is an odd game, its going to be hard to keep track of all the units, and even dividing the ships up into their squadrons, its still going to be a large number of people playing at once. On the other hand, I do love the Take Command style, and think it could work for this game. It's also the first real time game I've attempted to LP. So I'm going to put it up for a vote. But first, lets get back to the two styles I mentioned before. A normal LP, with player input being limited to "I wouldn't have done that" and You've lost the Warspite again! You Idiot" and other helpful comments. The first type is similar to most of my other LP's. Goons will take command of units of either the High Seas Fleet or the Grand Fleet,and give orders to their ships. These will then be issued by me, and I will record as yo send two lines of battleships crashing into each other at high speed. The game will be divided up into "turns" of between 10-20 minutes, and I'll take orders for each turn. The second type is something new, and would be a lot more work. but could lead to something rather interesting. it would be the same as above, except that the orders would be given by email rather than posts, and I would run at least 2 hours of the game before posting the first turn. Why do it like this? well here's the good bit. Each commander would get a map of what his ship can see. this would be the game map with me putting a fog of war over it. looking at it, I should be able to group people up, and should only have to produce a few maps per turn. I would mark suspected enemy formations on the map, depending on how they are reported. Communications would also ave to be run through me, and would be limited to 25 words per turn. (barring group commanders who would get two or three). I would then randomly "lose" some of these orders, but not tell anyone. to simulate the rubbish communications that dogged the real battle - I was thinking 30% of all communications. This should lead to new ships not being reported on time, and crucial orders being lost, just to make things interesting. This relegates the Peanut Gallery to commenting on event that occurred two hours in the past, but then, that's not always bad thing. It also forces commanders to work on their own intuitive and hope that they are going to get help. The other choice, which we may as well do now, is choose our side. 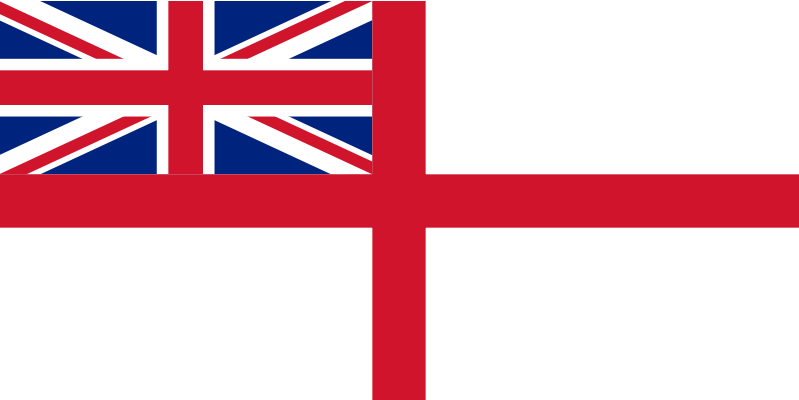 A) The Grand Fleet of the British Navy - 151 ships strong. Pros - Numerous, larger number of modern battleships. British. Cons - Less efficient range finders, poor night fighting capability. Ships have a disturbing tendency to explode. Pros German engineering, good armour and range finding, excellent night fighting. Cons - Very few modern battleships, several outdated Pre-dreadnaughts to make up numbers. Dirty Huns. *Please note, there may be a slight national bias in this summary. So, that's about it for now. Please cast your votes for the LP style and our side - I'll go into ship details more when we have picked a side. as there are to many for me to describe here for both sides. Oh yeah, one last thing. 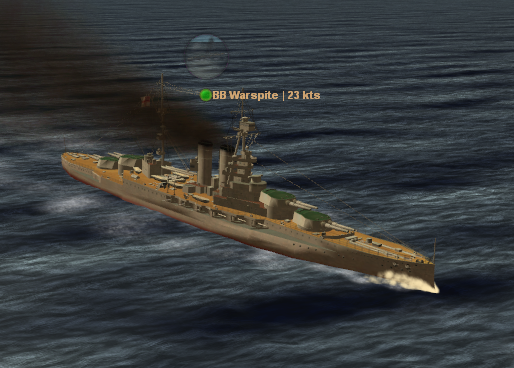 HMS Warspite - because some ships can never get enough love.